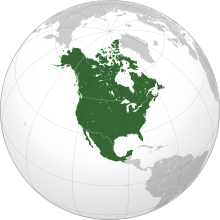 The North American Free Trade Agreement (NAFTA; Spanish: Tratado de Libre Comercio de América del Norte, TLCAN; French: Accord de libre-échange nord-américain, ALÉNA) is an agreement signed by Canada, Mexico, and the United States, creating a trilateral trade bloc in North America. The agreement came into force on January 1, 1994. It superseded the Canada–United States Free Trade Agreement between the U.S. and Canada. The Canada–United States Free Trade Agreement had been very controversial and divisive in Canada, and the 1988 Canadian election was fought almost exclusively on that issue. In that election, more Canadians voted for anti-free trade parties (the Liberals and the New Democrats) but the split caused more seats in parliament to be won by the pro-free trade Progressive Conservatives (PCs). Mulroney and the PCs had a parliamentary majority and were easily able to pass the 1987 Canada-U.S. FTA and NAFTA bills. However, he was replaced as Conservative leader and prime minister by Kim Campbell. Campbell led the PC party into the 1993 election where they were decimated by the Liberal Party under Jean Chrétien, who had campaigned on a promise to renegotiate or abrogate NAFTA; however, Chrétien subsequently negotiated two supplemental agreements with the new U.S. president. 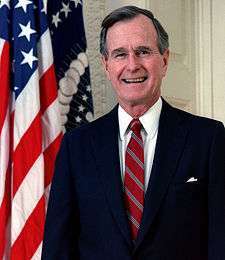 In the U.S., Bush, who had worked to "fast track" the signing prior to the end of his term, ran out of time and had to pass the required ratification and signing of the implementation law to incoming president Bill Clinton. 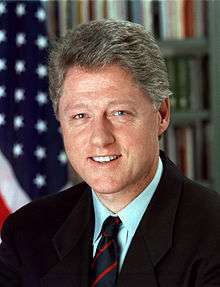 Prior to sending it to the United States Senate Clinton added two side agreements, The North American Agreement on Labor Cooperation (NAALC) and the North American Agreement on Environmental Cooperation (NAAEC), to protect workers and the environment, plus allay the concerns of many House members. It also required U.S. partners to adhere to environmental practices and regulations similar to its own. After much consideration and emotional discussion, the House of Representatives passed the North American Free Trade Agreement Implementation Act on November 17, 1993, 234-200. The agreement's supporters included 132 Republicans and 102 Democrats. The bill passed the Senate on November 20, 1993, 61-38. Senate supporters were 34 Republicans and 27 Democrats. Clinton signed it into law on December 8, 1993; the agreement went into effect on January 1, 1994. 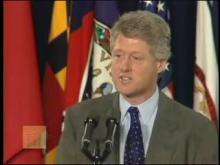 Clinton, while signing the NAFTA bill, stated that "NAFTA means jobs. American jobs, and good-paying American jobs. If I didn't believe that, I wouldn't support this agreement." The goal of NAFTA was to eliminate barriers to trade and investment between the U.S., Canada and Mexico. The implementation of NAFTA on January 1, 1994 brought the immediate elimination of tariffs on more than one-half of Mexico's exports to the U.S. and more than one-third of U.S. exports to Mexico. Within 10 years of the implementation of the agreement, all U.S.-Mexico tariffs would be eliminated except for some U.S. agricultural exports to Mexico that were to be phased out within 15 years. Most U.S.-Canada trade was already duty-free. NAFTA also sought to eliminate non-tariff trade barriers and to protect the intellectual property rights on traded products. Chapter 52 provides a procedure for the international resolution of disputes over the application and interpretation of NAFTA. It was modelled after Chapter 69 of the Canada-United States Free Trade Agreement. The roster of NAFTA adjudicators includes many retired judges, such as Alice Desjardins, John Maxwell Evans, Constance Hunt, John Richard, Arlin M. Adams, Susan Getzendanner, George C. Pratt, Charles B. Renfrew and Sandra Day O'Connor. Securing U.S. congressional approval for NAFTA would have been impossible without addressing public concerns about NAFTA’s environmental impact. The Clinton administration negotiated a side agreement on the environment with Canada and Mexico, the North American Agreement on Environmental Cooperation (NAAEC), which led to the creation of the Commission for Environmental Cooperation (CEC) in 1994. To alleviate concerns that NAFTA, the first regional trade agreement between a developing country and two developed countries, would have negative environmental impacts, the CEC was given a mandate to conduct ongoing ex post environmental assessment of NAFTA. In response to this mandate, the CEC created a framework for conducting environmental analysis of NAFTA, one of the first ex post frameworks for the environmental assessment of trade liberalization. The framework was designed to produce a focused and systematic body of evidence with respect to the initial hypotheses about NAFTA and the environment, such as the concern that NAFTA would create a "race to the bottom" in environmental regulation among the three countries, or the hope that NAFTA would pressure governments to increase their environmental protection mechanisms. The CEC has held four symposia using this framework to evaluate the environmental impacts of NAFTA and has commissioned 47 papers on this subject. In keeping with the CEC’s overall strategy of transparency and public involvement, the CEC commissioned these papers from leading independent experts. From the earliest negotiation, agriculture was (and still remains) a controversial topic within NAFTA, as it has been with almost all free trade agreements that have been signed within the WTO framework. Agriculture is the only section that was not negotiated trilaterally; instead, three separate agreements were signed between each pair of parties. The Canada–U.S. agreement contains significant restrictions and tariff quotas on agricultural products (mainly sugar, dairy, and poultry products), whereas the Mexico–U.S. pact allows for a wider liberalization within a framework of phase-out periods (it was the first North–South FTA on agriculture to be signed). 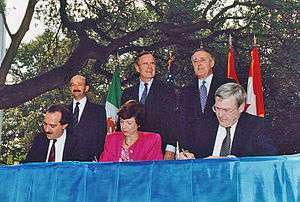 NAFTA's effects, both positive and negative, have been quantified by several economists, whose findings have been reported in publications such as the World Bank's Lessons from NAFTA for Latin America and the Caribbean, NAFTA's Impact on North America, and NAFTA Revisited by the Institute for International Economics. Like Mexico and the U.S., Canada received a modest positive economic benefit as measured by GDP. Many feared declines failed to materialize, and some industries, like the furniture industry, were expected to suffer but grew instead. Canadian manufacturing employment held steady despite an international downward trend in developed countries. One of NAFTA's biggest economic effects on U.S.-Canada trade has been to boost bilateral agricultural flows. In the year 2008 alone, Canada exports to the United States and Mexico were at $381.3 billion, and imports from NAFTA were at $245.1 billion. A 2007 study found that NAFTA has "almost zero welfare impact on member and nonmember countries". A 2015 study found that Canada's welfare decreased by 0.06% as a result of the NAFTA tariff reductions, and that Canada's intra-bloc trade increased by 11%. Maquiladoras (Mexican assembly plants that take in imported components and produce goods for export) have become the landmark of trade in Mexico. These are plants that moved to this region from the United States, hence the debate over the loss of American jobs. Income in the maquiladora sector has increased 15.5% since the implementation of NAFTA in 1994. Other sectors now benefit from the free trade agreement, and the share of exports from non-border states has increased in the last five years while the share of exports from maquiladora-border states has decreased. This has allowed for the rapid growth of non-border metropolitan areas, such as Toluca, León and Puebla; all three larger in population than Tijuana, Ciudad Juárez, and Reynosa. The overall effect of the Mexico–U.S. agricultural agreement is a matter of dispute. Mexico did not invest in the infrastructure necessary for competition, such as efficient rail roads and highways, which resulted in more difficult living conditions for the country's poor. Mexico's agricultural exports increased 9.4 percent annually between 1994 and 2001, while imports increased by only 6.9 percent a year during the same period. One of the most affected agricultural sectors is the meat industry. Mexico has gone from a small player in the pre-1994 U.S. export market to the second largest importer of U.S. agricultural products in 2004, and NAFTA may be credited as a major catalyst for this change. The allowance of free trade removed the hurdles that impeded business between the two countries. As a result, Mexico has provided a growing market for meat for the U.S., leading to an increase in sales and profits for the U.S. meat industry. This coincides with a noticeable increase in Mexican per capita GDP that has created large changes in meat consumption patterns, implying that Mexicans can now afford to buy more meat and thus per capita meat consumption has grown. Production of corn in Mexico has increased since NAFTA's implementation. However, internal corn demand has increased beyond Mexico's sufficiency, and imports have become necessary, far beyond the quotas Mexico had originally negotiated. Zahniser & Coyle have also pointed out that corn prices in Mexico, adjusted for international prices, have drastically decreased, yet through a program of subsidies expanded by former president Vicente Fox, production has remained stable since 2000. A 2015 study found that Mexico's welfare increased by 1.31% as a result of the NAFTA tariff reductions, and that Mexico's intra-bloc trade increased by 118%. Inequality and poverty fell in the most globalization-affected regions of Mexico over the introduction of NAFTA. 2013 and 2015 studies show that Mexican small farmers benefitted more on NAFTA than large-scale farmers. NAFTA has also been credited with the rise of the Mexican middle class. A Tufts University study found that NAFTA lowered the average cost of basic necessities in Mexico by up to 50%. This price reduction has increased cash-on-hand for many Mexican families, allowing Mexico to graduate more engineers than Germany each year. 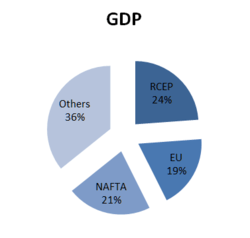 In 2015, the Congressional Research Service concluded that the "net overall effect of NAFTA on the U.S. economy appears to have been relatively modest, primarily because trade with Canada and Mexico accounts for a small percentage of U.S. GDP. However, there were worker and firm adjustment costs as the three countries adjusted to more open trade and investment among their economies." The U.S. Chamber of Commerce credits NAFTA with increasing U.S. trade in goods and services with Canada and Mexico from $337 billion in 1993 to $1.2 trillion in 2011, while the AFL-CIO blames the agreement for sending 700,000 American manufacturing jobs to Mexico over that time. The U.S. had a trade surplus with NAFTA countries of $28.3 billion for services in 2009 and a trade deficit of $94.6 billion (36.4% annual increase) for goods in 2010. This trade deficit accounted for 26.8 percent of all U.S. goods trade deficit. In a study published in the August 2008 issue of the American Journal of Agricultural Economics, NAFTA has increased U.S. agricultural exports to Mexico and Canada even though most of this increase occurred a decade after its ratification. The study focused on the effects that gradual "phase-in" periods in regional trade agreements, including NAFTA, have on trade flows. Most of the increase in members’ agricultural trade, which was only recently brought under the purview of the World Trade Organization, was due to very high trade barriers before NAFTA or other regional trade agreements. The U.S. foreign direct investment (FDI) in NAFTA countries (stock) was $327.5 billion in 2009 (latest data available), up 8.8% from 2008. The U.S. direct investment in NAFTA countries is in nonbank holding companies, and in the manufacturing, finance/insurance, and mining sectors. The foreign direct investment of Canada and Mexico in the United States (stock) was $237.2 billion in 2009 (the latest data available), up 16.5% from 2008. According to the Economic Policy Institute, California, Texas, Michigan and other states with high concentrations of manufacturing jobs were most affected by job loss due to NAFTA. EPI economist Robert Scott estimates some 682,900 U.S. jobs have been "lost or displaced" as a result of the trade agreement. For more details on this topic, see NAFTA's Impact on the Environment. According to the Department of Homeland Security Yearbook of Immigration Statistics, during fiscal year 2006 (i.e., October 2005 through September 2006), 73,880 foreign professionals (64,633 Canadians and 9,247 Mexicans) were admitted into the United States for temporary employment under NAFTA (i.e., in the TN status). Additionally, 17,321 of their family members (13,136 Canadians, 2,904 Mexicans, as well as a number of third-country nationals married to Canadians and Mexicans) entered the U.S. in the treaty national's dependent (TD) status. Because DHS counts the number of the new I-94 arrival records filled at the border, and the TN-1 admission is valid for three years, the number of non-immigrants in TN status present in the U.S. at the end of the fiscal year is approximately equal to the number of admissions during the year. (A discrepancy may be caused by some TN entrants leaving the country or changing status before their three-year admission period has expired, while other immigrants admitted earlier may change their status to TN or TD, or extend TN status granted earlier). Acording to the International Organization for Migration, deaths of migrants have been on the rise worldwide with 5,604 deaths in 2016. In 1996, the gasoline additive MMT was brought into Canada by Ethyl Corporation, an American company. At the time, the Canadian federal government banned the importation of the additive. The American company brought a claim under NAFTA Chapter 11 seeking US$201 million, from the Canadian government and the Canadian provinces under the Agreement on Internal Trade ("AIT"). The American company argued that their additive had not been conclusively linked to any health dangers, and that the prohibition was damaging to their company. Following a finding that the ban was a violation of the AIT, the Canadian federal government repealed the ban and settled with the American company for US$13 million. Studies by Health and Welfare Canada (now Health Canada) on the health effects of MMT in fuel found no significant health effects associated with exposure to these exhaust emissions. Other Canadian researchers and the U.S. Environmental Protection Agency disagree with Health Canada, and cite studies that include possible nerve damage. Canada had filed numerous motions to have the duty eliminated and the collected duties returned to Canada. After the United States lost an appeal from a NAFTA panel, it responded by saying "We are, of course, disappointed with the [NAFTA panel's] decision, but it will have no impact on the anti-dumping and countervailing duty orders." (Nick Lifton, spokesman for U.S. Trade Representative Rob Portman) On July 21, 2006, the United States Court of International Trade found that imposition of the duties was contrary to U.S. law. Several studies have rejected NAFTA as the force responsible for depressing the incomes of poor corn farmers, citing the trend's existence more than a decade before NAFTA's existence, an increase in maize production after NAFTA went into effect in 1994, and the lack of a measurable impact on the price of Mexican corn due to subsidized corn coming into Mexico from the United States, though they agree that the abolition of U.S. agricultural subsidies would benefit Mexican farmers. For more details on this topic, see Zapatista Army of National Liberation. The preparations for NAFTA included cancellation of Article 27 of Mexico's constitution, the cornerstone of Emiliano Zapata's revolution of 1910–1919. Under the historic Article 27, Indian communal landholdings were protected from sale or privatization. However, this barrier to investment was incompatible with NAFTA. With the removal of Article 27, Indian farmers feared the loss of their remaining lands, and also feared cheap imports (substitutes) from the US. Thus, the Zapatistas labelled NAFTA as a "death sentence" to Indian communities all over Mexico. Then EZLN declared war on the Mexican state on January 1, 1994, the day NAFTA came into force. Another contentious issue is the impact of the investor state dispute settlement obligations contained in Chapter 11 of the NAFTA. Chapter 11 allows corporations or individuals to sue Mexico, Canada or the United States for compensation when actions taken by those governments (or by those for whom they are responsible at international law, such as provincial, state, or municipal governments) violate the international law. This chapter has been criticized by groups in the U.S., Mexico, and Canada for a variety of reasons, including not taking into account important social and environmental considerations. In Canada, several groups, including the Council of Canadians, challenged the constitutionality of Chapter 11. They lost at the trial level and have subsequently appealed. Methanex Corporation, a Canadian corporation, filed a US$970 million suit against the United States, claiming that a California ban on Methyl tert-butyl ether (MTBE), a substance that had found its way into many wells in the state, was hurtful to the corporation's sales of methanol. However, the claim was rejected, and the company was ordered to pay US$3 million to the U.S. government in costs. The tribunal based its decision namely on following reasoning: But as a matter of general international law, a non-discriminatory regulation for a public purpose, which is enacted in accordance with due process and, which affects, inter alios, a foreign investor or investment is not deemed expropriatory and compensable unless specific commitments had been given by the regulating government to the then putative foreign investor contemplating investment that the government would refrain from such regulation. In another case, Metalclad, an American corporation, was awarded US$15.6 million from Mexico after a Mexican municipality refused a construction permit for the hazardous waste landfill it intended to construct in Guadalcázar, San Luis Potosí. The construction had already been approved by the federal government with various environmental requirements imposed (see paragraph 48 of the tribunal decision). The NAFTA panel found that the municipality did not have the authority to ban construction on the basis of the environmental concerns. Eli Lilly and Company v. Government of Canada is a US$500mn claim for faulty drug patent legislation. Apotex is suing the U.S. for US$520 million because of lost opportunity in a FDA generic drug decision. Lone Pine Resources Inc. v. Government of Canada has filed a US$250mn claim against Canada, whom it accuses of "arbitrary, capricious and illegal" behaviour, because Quebec aims to prevent fracking exploration under the St. Lawrence Seaway. Milos Barutciski, the lawyer who represents Lone Pine, has decried attempts to portray his client as "another rapacious multinational challenging governments’ ability to regulate for health, safety and the environment". Lone Pine Resources is incorporated in Delaware but headquartered in Calgary, and had an initial public offering of stock on the NYSE on May 25, 2011, which offered 15 million shares each for $13 and raised US$195 million. Barutciski acknowledged "that NAFTA and other investor-protection treaties create an anomaly in that Canadian companies that have also seen their permits rescinded by the very same Quebec legislation, which expressly forbids the paying of compensation, do not have the right pursue a NAFTA claim," and that winning "compensation in Canadian courts for domestic companies in this case would be more difficult since the Constitution puts property rights in provincial hands." A treaty with China would extend similar rights to Chinese investors, including SOEs. Also contentious is NAFTA's Chapter 19, which subjects antidumping and countervailing duty (AD/CVD) determinations to binational panel review instead of, or in addition to, conventional judicial review. For example, in the United States, review of agency decisions imposing antidumping and countervailing duties are normally heard before the U.S. Court of International Trade, an Article III court. NAFTA parties, however, have the option of appealing the decisions to binational panels composed of five citizens from the two relevant NAFTA countries. The panelists are generally lawyers experienced in international trade law. Since the NAFTA does not include substantive provisions concerning AD/CVD, the panel is charged with determining whether final agency determinations involving AD/CVD conform with the country's domestic law. Chapter 19 can be considered as somewhat of an anomaly in international dispute settlement since it does not apply international law, but requires a panel composed of individuals from many countries to re-examine the application of one country's domestic law. A Chapter 19 panel is expected to examine whether the agency's determination is supported by "substantial evidence." This standard assumes significant deference to the domestic agency. Some of the most controversial trade disputes in recent years, such as the U.S.-Canada softwood lumber dispute, have been litigated before Chapter 19 panels. In a 60 Minutes interview in September 2015, Trump condemned the North American Free Trade Agreement (NAFTA), calling it "the single worst trade deal ever approved in [the United States]", going on to say that if elected president, "We will either renegotiate it, or we will break it." Juan Pablo Castañón, president of the Consejo Coordinador Empresarial, expressed his concerns about the renegotiation and the willingness to focus on the car industry that has brought a lot of success A range of trade experts have said that pulling out of NAFTA as Trump proposed would have a range of unintended consequences for the U.S., including reduced access to the U.S.'s biggest export markets, a reduction in economic growth, and increased prices for gasoline, cars, fruits, and vegetables. Members of the private iniciative in Mexico said that in order to eliminate NAFTA there are a lot of laws that have to be adapted by the U.S.A Congress and this will also eventually result in legal complaints by the World Trade Organization. The Washington Post fact-checker furthermore noted that a Congressional Research Service review of the academic literature on NAFTA concluded that the "net overall effect of NAFTA on the U.S. economy appears to have been relatively modest, primarily because trade with Canada and Mexico accounts for a small percentage of U.S. GDP." If the Trans-Pacific Partnership comes into effect, existing agreements like NAFTA will be reduced to those provisions that do not conflict with the TPP, or that require greater trade liberalization than the TPP. ↑ NAFTA Secretariat. Nafta-sec-alena.org (June 9, 2010). Retrieved on July 12, 2013. ↑ Calculated using UNDP data for the member states. If considered as a single entity, NAFTA would rank 23rd among the other countries. ↑ "Free Trade Agreements". Office of the United States Trade Representative. Retrieved 2016-08-23. ↑ "Canada-United States Free Trade Agreement (FTA)". Foreign Affairs, Trade, and Development Canada. Retrieved December 3, 2014. ↑ NAFTA: Final Text, Summary, Legislative History & Implementation Directory. New York: Oceana Publications. 1994. pp. 1–3. ISBN 0-379-00835-1. ↑ "H.R.3450 – North American Free Trade Agreement Implementation Act". Retrieved December 29, 2014. ↑ "Clinton Signs NAFTA – December 8, 1993". Miller Center. University of Virginia. Retrieved January 27, 2011. ↑ "NAFTA Timeline". Fina-nafi. Retrieved July 4, 2011. ↑ Rothbard, Murray. "The NAFTA Myth". Mises Institute. Mises Institute. Retrieved 18 March 2016. ↑ "IngentaConnect NAFTA Commission for Environmental Cooperation: ongoing assessment". Ingentaconnect.com. December 1, 2006. doi:10.3152/147154606781765048. Retrieved July 25, 2015. ↑ "Trade and Environment in the Americas". Cec.org. Retrieved November 9, 2008. ↑ Sergie, Mohammed Aly (14 February 2014). "NAFTA's Economic Impact". Council on Foreign Relations think tank. Retrieved 5 August 2014. 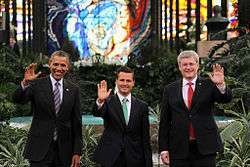 ↑ "NAFTA – Fast Facts: North American Free Trade Agreement". NAFTANow.org. April 4, 2012. Retrieved October 26, 2013. ↑ Romalis, John (2007-07-12). "NAFTA's and CUSFTA's Impact on International Trade". Review of Economics and Statistics. 89 (3): 416–435. doi:10.1162/rest.89.3.416. ISSN 0034-6535. 1 2 3 4 Caliendo, Lorenzo; Parro, Fernando (2015-01-01). "Estimates of the Trade and Welfare Effects of NAFTA". The Review of Economic Studies. 82 (1): 1–44. doi:10.1093/restud/rdu035. ISSN 0034-6527. ↑ "Clark, Georgia Rae. 2006. Analysis of Mexican demand for Meat: A Post-NAFTA Demand Systems Approach. MS Thesis, Texas Tech University" (PDF). Retrieved July 4, 2011. 1 2 Burfisher, Mary E; Robinson, Sherman; Thierfelder, Karen (2001-02-01). "The Impact of NAFTA on the United States". Journal of Economic Perspectives. 15 (1): 125–144. doi:10.1257/jep.15.1.125. ISSN 0895-3309. ↑ H, Hanson, Gordon (2007-03-09). "Globalization, Labor Income, and Poverty in Mexico". ↑ "Maintenance page : Wiley Online Library". Review of Development Economics. 17: 594–608. doi:10.1111/rode.12053. ↑ "Maintenance page : Wiley Online Library". Journal of International Development. 27: 112–132. doi:10.1002/jid.2814. ↑ O'Neil, Shannon (March 2013). "Mexico Makes It". Foreign Affairs. 92 (2). Retrieved 19 March 2016. ↑ Taylor, Guy (14 May 2012). "NAFTA key to economic, social growth in Mexico". The Washington Times. The Washington Times, LLC. Retrieved 19 March 2016. ↑ "Poll Results | IGM Forum". www.igmchicago.org. 13 March 2012. Retrieved 2016-01-01. ↑ "The North American Free Trade Agreement (NAFTA)" (PDF). 1 2 3 4 "North American Free Trade Agreement (NAFTA)". Office of the United States Trade Representative. Retrieved December 3, 2014. ↑ Newswise: Free Trade Agreement Helped U.S. Farmers Retrieved on June 12, 2008. ↑ "North American Free Trade Agreement (NAFTA) | United States Trade Representative". ustr.gov. Retrieved 2016-10-12. ↑ "NAFTA's Impact on U.S. Workers". Economic Policy Institute. Retrieved 2016-10-12. ↑ U.S. Economy Lost Nearly 700,000 Jobs Because Of NAFTA, EPI Says. The Huffington Post. July 12, 2011. 1 2 3 "Environmental Damages Underscore Risks of Unfair Trade". Sierraclub.org. Retrieved March 4, 2014. ↑ "IngentaConnect NAFTA Commission for Environmental Cooperation: ongoing assessment of trade liberalization in North America". Ingentaconnect.com. Retrieved November 9, 2008. ↑ DHS Yearbook 2006. Supplemental Table 1: Nonimmigrant Admissions (I-94 Only) by Class of Admission and Country of Citizenship: Fiscal Year 2006 Archived February 28, 2011, at the Wayback Machine. ↑ Jones, Reese. Borders & Walls: Do Barriers Deter Unauthorized Migration. Migration Policy Institute. [web page]http://www.migrationpolicy.org/article/borders-and-walls-do-barriers-deter-unauthorized-migration October 5th, 2016. ↑ "Facts and Figures 2006 – Immigration Overview: Permanent and Temporary Residents". Cic.gc.ca. June 29, 2007. Archived from the original on August 22, 2008. Retrieved November 9, 2008. ↑ The Global Perspective of Migration and Develomplent. GMDF Puerto Vallarta and Beyond. Springer Science & Business media. May 23th, 2012. ↑ "Dispute Settlement". Dfait-maeci.gc.ca. October 15, 2010. Retrieved July 4, 2011. ↑ "MMT: the controversy over this fuel additive continues". canadiandriver.com. Retrieved July 4, 2011. ↑ softwood Lumber Archived June 16, 2008, at the Wayback Machine. ↑ Statement from USTR Spokesperson Neena Moorjani Regarding the NAFTA Extraordinary Challenge Committee decision in Softwood Lumber Archived May 9, 2008, at the Wayback Machine. ↑ Statement by USTR Spokesman Stephen Norton Regarding CIT Lumber Ruling Archived May 9, 2008, at the Wayback Machine. ↑ "NAFTA – Chapter 11 – Investment; Cases Filed Against the Government of Canada; Gottlieb Investors Group v. Government of Canada"
↑ Fiess, Norbert; Daniel Lederman (November 24, 2004). "Mexican Corn: The Effects of NAFTA" (PDF). Trade Note. The World Bank Group. 18. Retrieved March 12, 2007. ↑ "NAFTA, Chapter 11". Sice.oas.org. Retrieved July 4, 2011. ↑ www.international.gc.ca: "The North American Free Trade Agreement (NAFTA) – Chapter 11 – Investment"
↑ "'North American Free Trade Agreement (NAFTA)', Public Citizen". Citizen.org. January 1, 1994. Retrieved July 4, 2011. ↑ Red Mexicana de Accion Frente al Libre Comercio. "NAFTA and the Mexican Environment". Archived from the original on May 21, 2006. ↑ "The Council of Canadians". Canadians.org. Retrieved July 4, 2011. ↑ Commission for Environmental Cooperation. "The NAFTA environmental agreement: The Intersection of Trade and the Environment". Cec.org. Retrieved July 4, 2011. ↑ PEJ News. "Judge Rebuffs Challenge to NAFTA'S Chapter 11 Investor Claims Process". Pej.org. Retrieved July 4, 2011. ↑ "Arbitration award between Methanex Corporation and United States of America" (PDF). (1.45 MB) Archived June 16, 2007, at the Wayback Machine. ↑ "Arbitration award between Metalclad Corporation and The United Mexican States" (PDF). (120 KB) Archived June 16, 2007, at the Wayback Machine. ↑ "Eli Lilly and Company v. Government of Canada"
↑ "Cases Filed Against the Government of Canada Lone Pine Resources Inc. v. Government of Canada"
1 2 3 Millán, Juan. "North American Free Trade Agreement; Invitation for Applications for Inclusion on the Chapter 19 Roster" (PDF). Federal Register. Office of the United States Trade Representative. Retrieved 19 March 2016. ↑ Politco Staff. "Full transcript: First 2016 presidential debate". Politico. Retrieved 27 September 2016. ↑ Jill Colvin, Trump: NAFTA trade deal a 'disaster,' says he'd 'break' it, Associated Press (September 25, 2015). ↑ Mark Thoma, Is Donald Trump right to call NAFTA a "disaster"?, CBS News (October 5, 2015). ↑ Gonzales, Lilia (November 14, 2016). "El Economista". ↑ Eric Martin, Trump Killing Nafta Could Mean Big Unintended Consequences for the U.S., Bloomberg Business (October 1, 2015). ↑ Isfeld, Gordon (12 October 2015). "Forget NAFTA, the TPP is the new 'gold standard' of global trade". Financial Post. National Post. Retrieved 31 December 2015.